At a sidewalk café in the Plaça de Sant Jaume, patrons chat over their cafés con leche or sit reading the paper, their dogs lying patiently at their feet. Trees shade this corner of the city from the summer sun, turning the café and its little square into oases of cool, civilized tranquility. Yet mere steps away is the busy Plaza de la Virgen, with its government buildings, spouting fountain, and camera-toting tourists from a dozen countries. I’ve walked to Sant Jaume along the narrow streets of the ciutat vella, the old city. It’s been a long, meandering ramble, and at practically every corner, it seems, is a plaza, a medieval building, or a row of elegant, neo-classical facades. This is one of Europe’s largest and best-preserved historic centers; it can take days to explore it all. And after you’ve done that, there are still the many modern neighborhoods to see, with their shops, museums, concert halls, parks, and chic apartment buildings. Valencia is Spain’s third-largest city. But it’s just a fraction of the size of Madrid or Barcelona. With a population of less than 800,000 in the city proper, and about 1.7 million in the great metro area, it’s a big city in a small, intimate package. For tourists, Valencia offers a mild, Mediterranean climate, urban beaches, plenty of culture, and that large historic center to wander. 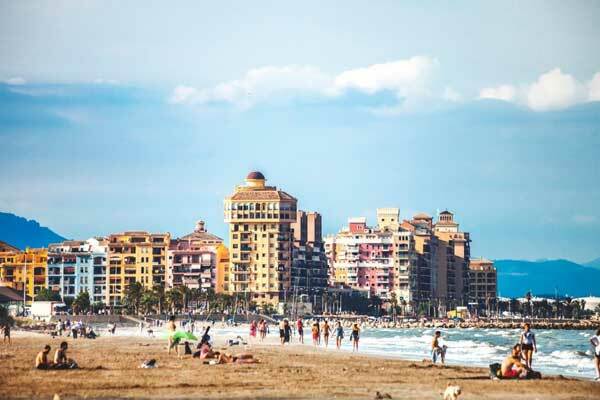 And if you’re looking for a place in Europe to call home, whether full- or part-time, you’ll find in Valencia all the First-World lifestyle, urban amenities, and real estate you could want… and costing a fraction of what you’d pay in Madrid or Barcelona. 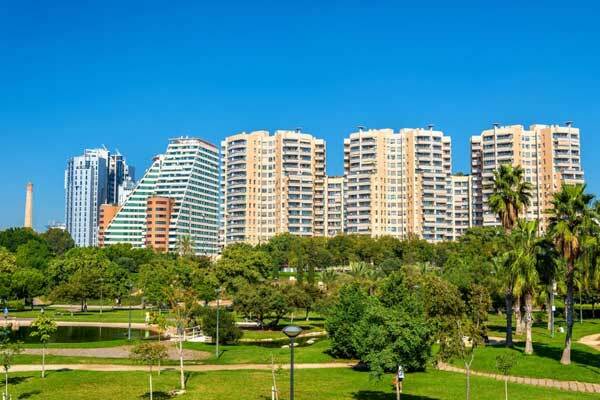 For comfortable urban living at very comfortable prices, Valencia ticks all the right boxes. Valencia’s international airport, about six miles outside town, connects the city to the rest of Europe. You can access the airport on public transport: airport shuttles, regular buses, and Valencia’s sleek metro system. Valencia’s climate is famously mild. July and August are usually the hottest months, with cool mornings and evenings but with late afternoon temperatures that can soar into the mid- to upper 80s F, with high humidity. Daytime winter temperatures average in the low 60s F—I’ve strolled the city in February in only a light linen jacket. And a full eight months of the year enjoy summery, short-sleeves weather. Valencia is Spain’s largest container port on the Mediterranean, and it also has long stretches of beach right in the city—you can take a bus or the metro there. Seaside restaurants and small hotels line the beachfront, and palm trees are everywhere, all over the city, leaving no doubt that you’re in a warm-weather climate. The city is also very green. There are numerous parks. But even more importantly, a great swath of greenway runs from northwest to southeast, in a long curve right through the middle of the city, all the way to the sea. Called the Turia Garden, this swath was once the riverbed of the River Turia. Today it’s home to green meadows, giant shade trees, walking and bicycle paths, and kiddie gardens. Toward its seaward end the Turia Garden is home to the City of Arts and Sciences: a vast entertainment complex that includes a planetarium, a science museum, the largest ocean aquarium in Europe, an opera house and performing-arts center, an IMAX Cinema, and more. I walked in the Turia Garden as often as I could, sharing the space with joggers, cyclists, people walking their dogs, and business types heading to the park’s metro stop, Alameda. I even enjoyed tapas here one night, sitting tranquilly amidst trees and chirping birds—yet only a five-minute walk from Valencia’s historic center. For the ciutat vella—as well as a number of other pleasant residential neighborhoods—sit right along the Turia Gardens. Thanks to their central location and their proximity to parks, these neighborhoods are among the most pleasant in the city. They’re attractive, upscale, and well-served by public transportation. With all these pluses, they proved to be among my personal favorites for housing options. Here’s a walking tour of some of these districts. Valencia’s historic center, the ciutat vella (as it’s called in Valenciano), is practically a city-within-a-city. It’s filled with narrow, cobbled streets, some medieval Christian towers and monuments, the 13th-century cathedral, and remains of Moorish walls, all reminders of Valencia’s 2,000-year-old history. But it’s hardly a relic. It’s crisscrossed with a few broad, modern streets that house shops on the ground floor, and most ordinary buildings look 19th century or later. Valencia’s main city and provincial government buildings are in the ciutat vella. So are the Valencia Stock Exchange, the main bank offices, some museums, and the city’s huge central market. Though the ciutat vella is where the tourists flock, it’s also home to some 26,000 locals. Many of the ciutat vella’s neo-classical buildings have been converted into apartments, some of them quite large, family-sized dwellings. And, away from the main plazas where the tourists congregate, the old city can be quite a tranquil place to live. This is particularly true of the eastern part that borders the Turia Garden: the neighborhoods of La Seu and La Xerea. These are stable neighborhoods of narrow streets and offer a range of properties. A two-bedroom, one-bath apartment in a central, easily accessed part of the La Xerea neighborhood, totally renovated, with 796 square feet of living space, was recently on sale for €185,000—about $216,450. There are plenty of more expensive properties on offer in this area—but this one is not the cheapest, either. Decent furnished rentals in this neighborhood start at about €600—about $702. 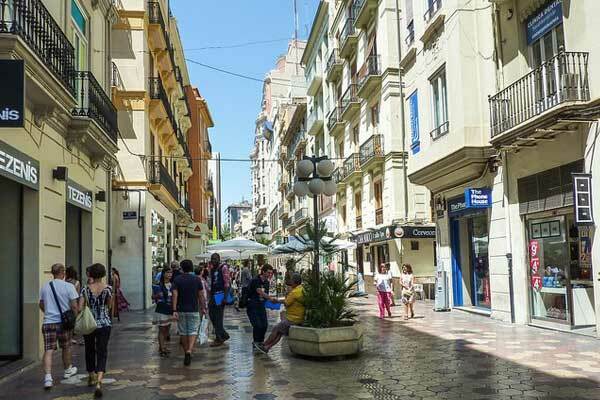 The ciutat vella’s southern end is more commercial, with several pedestrian-only streets of shops, fast-food outlets, and large multi-level stores that are part of the Spanish chain El Corte Inglés. This area tends to be crowded during shopping hours and rather noisy for living. But it’s an easy walk here from elsewhere in the ciutat vella. And the presence of these stores—plus the central market and the many small shops scattered around—means you can buy just about anything you’d want within the confines of the ciutat vella. The El Carmen neighborhood, in the ciutat vella’s northwest corner, is the bohemian, artsy area. Parts of it, such as the charming Plaça de Sant Jaume, have a slight Left Bank feel to them. This area attracts a lot of young, both as tourists and residents, and some streets can be noisy late at night. El Carmen is definitely a neighborhood you’d want to explore in person before buying or renting a specific apartment. Some parts of El Carmen are charming, while other streets look rundown. My friends in Valencia, however, tell me that everyplace in the old city is safe. Due east of the ciutat vella, across the Turia Garden, is a district known as Pla del Real. This is a more modern neighborhood, with a layout that’s typical of upscale neighborhoods in Spanish cities: Streets are wide, with broad sidewalks on each side, lending an open, airy feel. Most buildings are mid-rise—perhaps eight to 10 stories. Shops are on the ground floor and balconied apartments above. I saw a range of shops here: hairdressers, clothing boutiques, green grocers, outdoor cafés… I even spied a school here, and the university is walking distance away. There are two metro stops nearby, and convenient bus service. If you’re looking to rent, you can choose among some large, beautiful, furnished apartments in this neighborhood. Monthly rents for a nice two- to three-bedroom apartment start at about €750 (about $878). Depending on the location and furnishings, you can get 900 square feet or more for that price. You’d probably have to pay at least double that amount for comparable digs, in comparable neighborhoods, in Madrid or Barcelona. For those who want to go upscale, there’s the L’Eixample district, especially the neighborhood known as El Pla del Remei. Lying southeast of the ciutat vella, El Pla del Remei is home to designer boutiques and the well-heeled crowd. Here you’ll find the chic Mercado Colón, with its wine bars, coffee shops, and seafood restaurants catering to the blue-suit population. This neighborhood is quiet and well-groomed, with impeccable buildings and manicured shade trees. You’re within easy walking distance of the Turia Garden and of the ciutat vella. Not surprisingly, El Pla del Remei isn’t cheap—but for one of the most exclusive neighborhoods in the city, it’s not that expensive, either. Expect sale properties to start in the mid-€200,000s (from about $292,500) for one and two-bedroom apartments. For the nicer parts of L’Eixample like El Pla del Remei, expect to pay in the €900-a-month range (about $1,053) or more for a rental with around 1,000 square feet of space. Note that many may come unfurnished.